Last year, a late frost knocked out many of the season’s chokecherries, service berries and acorns. Then, a dry summer exasperated the flowers, forbs and grasses. To the average citizen this may have gone unnoticed, except that bear activity spiked. In 2017, 190 bears were euthanized by Colorado Parks and Wildlife (CPW), a number much higher than average and in direct correlation to the lack of natural foods. In Carbondale, Colorado, an estimated 12 bears roamed the municipality by August, an unprecedented number according to John Groves, a district wildlife manager for CPW. Groves appealed to the Carbondale Board of Town Trustees, warning that the lack of proper trash containment would result in deaths among the bears.. . In the nearby city of Aspen, bear incidents, including frequent home and vehicle break-ins, have become a regular part of summer. Black Bears, storing fat for hibernation, can eat up to 30 pounds a day and are highly incentivized by foods found in and around human residences. 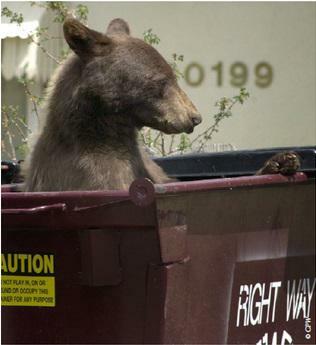 Following the dramatic summer of 2017, the Town of Carbondale has since replaced all municipal trash receptacles with bear resistant containers and the City of Aspen has more than doubled fines for wildlife harassment. Still, I couldn’t help but ask: what other approaches are being taken? With bad bear years on the rise and some bears recorded as foregoing hibernation altogether, the occurrence human-bear interactions are becoming more common. When natural foods are nonexistent, is there any alternative to locking out the starving bears? A variety of plants were selected to offset the effects of early and late freezes and they’re beginning to show promise. As expanding human development and climate change alter habitat conditions for the estimated 19,000 black bears living in Colorado, creative initiatives like establishing a native food buffer zone could help save the desperate animals from risking conflict with humans. For Western Slope Resources Reporting, I’m Raleigh Burleigh. A young bear enjoys some urban snacking.